RPM comparisons: unlike wattage which is assessed when a machine is certified, there is no enforced standard for measuring RPM of appliances. Some resellers have quoted a high RPM to sell their product. Often this is a theoretical calculation or other unspecified assessment. A machine’s actual performance under load is the only reliable means of assessment. For this reason OmniBlend Australia does not quote RPM and uses real world application testing to rate genuine performance. 14 day money back guarantee: if you are not satisfied with your machine. Upon receipt of your returned machine we will refund your purchase price in full. Please contact us prior to return to arrange details. OmniBlend Australia sells commercial grade OmniBlend machines manufactured by JTC in China, the originator of this machine. All our machines are branded with the manufacturer’s company and model name. There are many positive independent reviews for JTC OmniBlend brand machines from around the world. 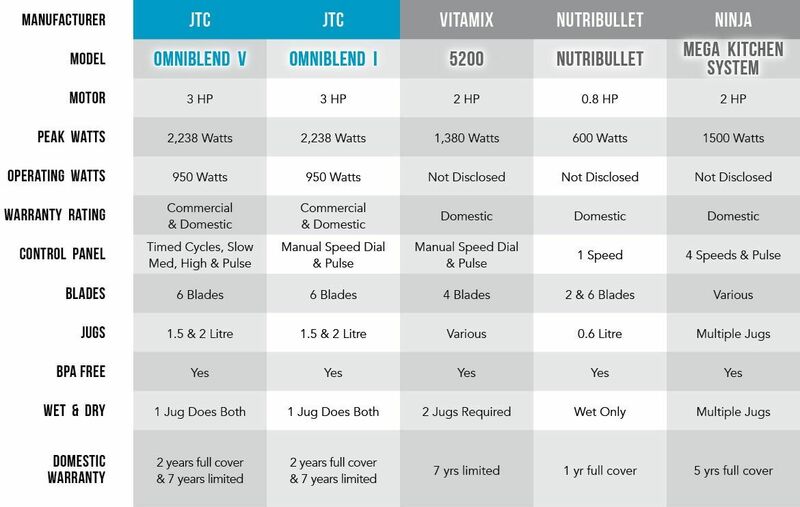 Please note: In Australia, only OmniBlend brand machines are made by JTC. 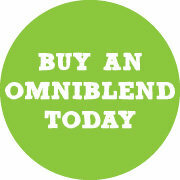 Because of OmniBlend’s popularity, there are various look-a-like machines in the market which are not the same quality. Don’t judge a book by its cover! Why is OmniBlend Australia’s best power blender? OmniBlend has combined the best design features to create one of the fastest and most powerful food preparation machines, delivered by a rugged 3HP motor. This commercial power blender is suitable for heavy duty use in restaurants and juice bars and brings a new level of professionalism and food creativity to the home kitchen. OmniBlend’s have the power and performance to break down the cell walls of leafy greens, root vegetables, releasing valuable phytonutrients in an easy to use form for your body. OmniBlend Power Blenders are manufactured by JTC, a company with over 35 years experience and a industry leader. These machine are built under strict quality control, using proprietary materials for the strongest build quality. OmniBlend Australia is dedicated to ongoing research and development, providing innovation in the health sector. Beware of cheap copies. In Australia, only OmniBlend branded machines are the genuine thing! OmniBlend has been tried and test over the last 19 years, globally sold in more than 90 countries. It is used commercially by restaurants and smoothie bars around the world and throughout Australia. It has a proven track record backed by 1000’s of independent reviews globally. OmniBlend Australia offers a 7 year warranty for assurance. OmniBlend Australia is dedicated to providing high quality and performance blenders, that are more affordable and will last a lifetime. When considering performance, quality, longevity, price and warranty we strongly believe that OmniBlend heavy duty power blenders are the best blenders on the market in Australia. This page was first published 18.05.2014. OmniBlend Australia has researched and compiled documentation from the respective distributors. We strive for accuracy and transparency. Should anybody wish to supply evidence to revise the information, please contact us on 02 66 843 837.